Celebrate Inspiration by Rotary Clubs in our District and Worldwide! 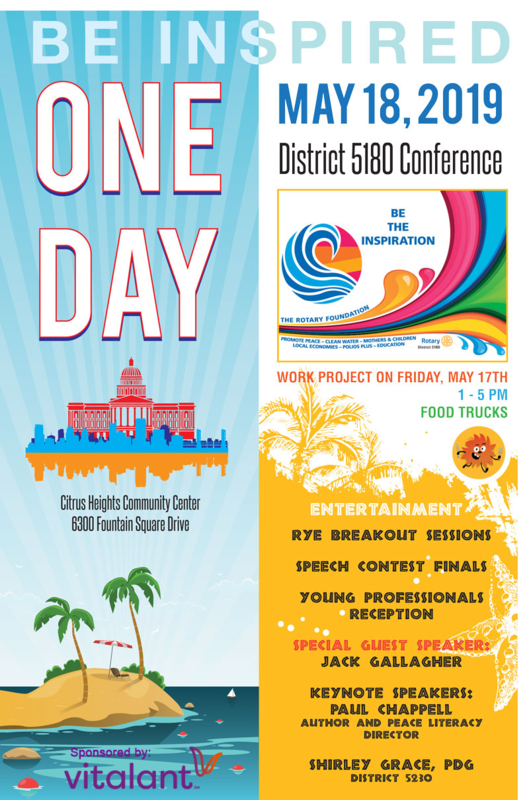 We’re changing it up – our district conference will only be ONE DAY and will be local! Top notch speakers, inspiration, fellowship, fun, awards, recognition! An interactive session with our fabulous RYE students, rum tasting, Rotary Jeopardy and Rotary vendors. Relax in the “Retreat” between sessions, visiting with fellow Rotarians and friends, and enjoying a snack! Non-Rotarian spouse/partner conference registration is FREE! Enjoy our Hospitality Suite after the evening session – sponsored by the District and several Rotary Clubs! Mix, mingle and continue celebrating!